Do you long for connection and balance as a Dad? This 8-week Dad’s group combines mindfulness practices and experiential exercises to support fathers with children of all ages. Through cultural conditioning and misguided beliefs around what it means to be a father, men have historically been cut off from their hearts, authentic presence, and true gifts. 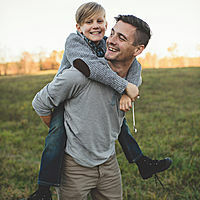 This program provides a safe space for fathers to explore their beliefs and cultural conditioning, cultivate the ability and skills to connect authentically and compassionately, foster the capacity to respond to our families with heart and strength, and care for ourselves in a way that models self-compassion, healthy masculinity, true power and presence. 1. Foster a greater understanding of our individual conditioning that affects how we parent. 2. Cultivate an awareness of habitual patterns of thought and reactivity so that we can choose to respond to our families with compassion and skill. 3. Explore and challenge limiting beliefs that heighten and model reactivity to our families. 4. Learn to connect to our direct experience, our bodies and minds in a community of fathers. 5. Explore and practice communication that builds self-awareness, heightens intimacy and connection with our families. 6. Build a lifestyle that supports connection, authenticity, healthy masculinity, mindfulness practice and self-compassion.